Reading the signs a couple of years ago it was easy to assume that the art of blogging was set to die a painful death at the hands of social networks like Facebook and Twitter and others. While social has changed how we communicate online, blogging remains a core part of things. In fact, the truth is that there’s never been a better time to blog. Social networks help build audiences and deliver content to readers, and more established blogs and websites often link to or aggregate smaller sites, sending swarms of viewers to read articles — The Daily Mail aside. So, whether you’re a blogger returning from a break, seeking a new home or are looking to write online for the first time, here’s our guide to what blogging platforms are out there. WordPress has two options: a freemium hosted service that provides .wordpress.com domains — e.g. jonrussell.wordpress.com (but you can still pay to use your own domain) — and includes limited customization. Or the completey free .org version which allows for you to host WordPress on your own servers with much more control, edit themes to your hearts content, hack code and add as many blog plugins as you wish. It is, in simple terms, the daddy of blogging. The platform powers almost 19 percent of the Web and has been downloaded more than 45 million times. One of the platform’s core strengths is its community of creatives, who have produced thousands of customizations and tweaks allowing WordPress users to add sophisticated and powerful plug-ins (features) to their blog, or dress it up in a new layout or design. Cons: Vast array of options can be complicated for less-experienced users — tread carefully. Verdict: Still the best option out there. WordPress is especially useful for companies or those looking to develop (or have someone else develop) a sophisticated website. Google’s take on blogging is Blogger, an easy-to-use and free platform that requires only a Gmail/Google account to get started. Blogger blogs can be customized with new backgrounds and layouts easily. Unsurprisingly, the platform is hardwired into Google’s AdSense advertising program (which might make the average blogger enough money for a cup of coffee each month) and other Google services like Google+ (for comments) and Feedburner (for RSS distribution) are easily configured. Pros: Easy to use and get started. Cons: Not particularly sophisticated and tied to Google — which killed off Google Reader, lest we forget. Verdict: Less popular in this era, but Blogger is often the place where many, including this author, began writing online. Its customization options pale in comparison compared to others, and the layout looks a little dated when held against newer platforms. The cool kid on the blogging block, Tumblr was arguably the first mainstream service to combine blogging and social media…leading eventually to Yahoo stumping up $1.1 billion to buy it. 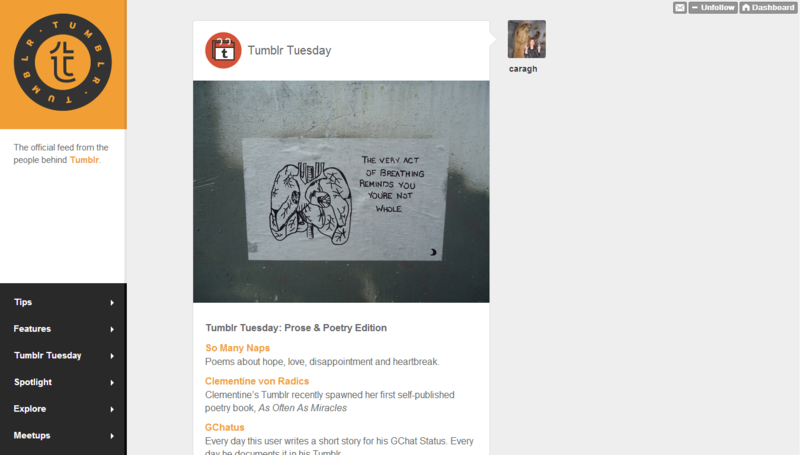 Tumblr has a strong community of users, much like Twitter or Facebook, thanks to the ease in which other users’ content can be reblogged to your Tumblr account. That makes it a different kind of platform to the likes of WordPress, and users — particularly of the younger generation — tend to turn to Tumblr blogs to curate items that they like rather than produce their own content. More benefits: Tumblr supports custom domain names and is ludicrously easy to use from mobile, including photo uploads. 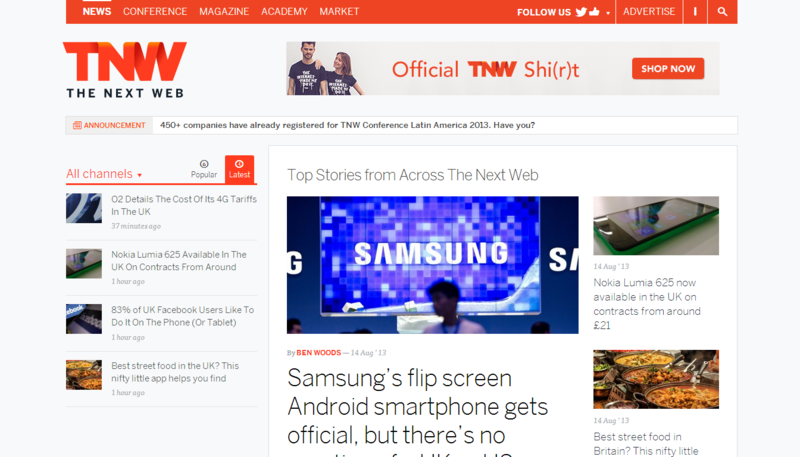 As of May 2014, it also blog theme customization via its mobile apps. Pros: Owned by Yahoo — Tumblr was almost out of money when Yahoo swooped in to buy it. Cons: Owned by Yahoo — Yahoo CEO Marissa Mayer has hinted that ads could make their way to Tumblr blogs. Verdict: More of a social network than a blog, but a good option if you seek something quick and easy. Indeed, we’re noticing increasing numbers of companies that keep Tumblr blogs, often separately to their main blogs. 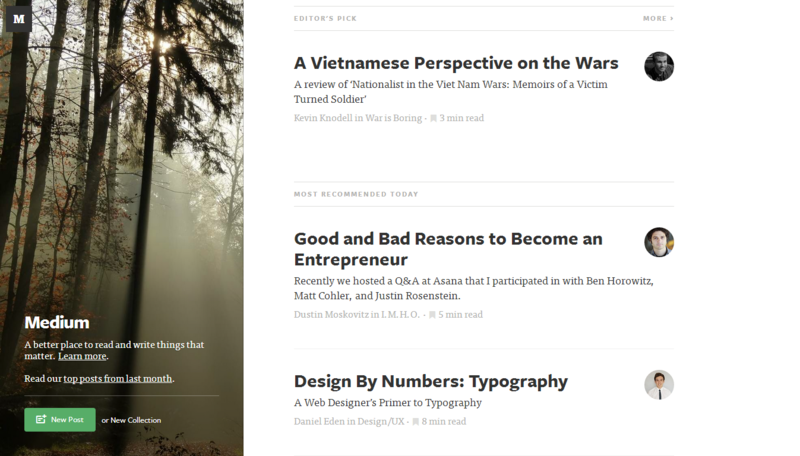 If blogs were bars, Medium is probably the hippest place to be seen at right now. Not only was it started by Twitter founders Ev Williams and Biz Stone, but has a ‘social layer’ — which includes a feature letting users edit and annotate other people’s work, while it obviously integrates well with Twitter. Medium is cool but there are some key differences compared to other platforms. For one thing, its features are rigid while the way it links to other content on its network can frustrate writers enough to leave. Twitter has been called the global town square and, in that context, Medium a side room away from the 140-character shouting and chaos where people try to work over interesting topics in more detail. 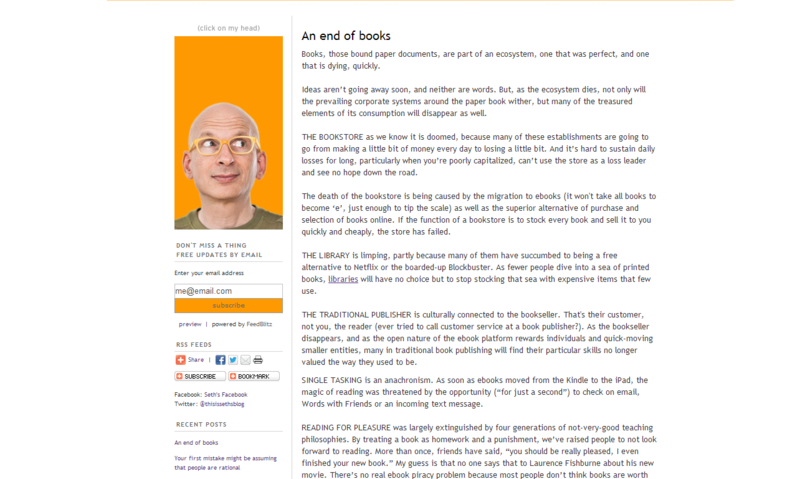 The site quietly opened to all potential authors in October 2013. There is currently no app for composing posts on mobile devices, but Medium does offer a read-only app for iOS. Pros: A great place to showcase your content to a (potentially) large audience. Cons: Lack of customization and some content discovery issues, for writers. 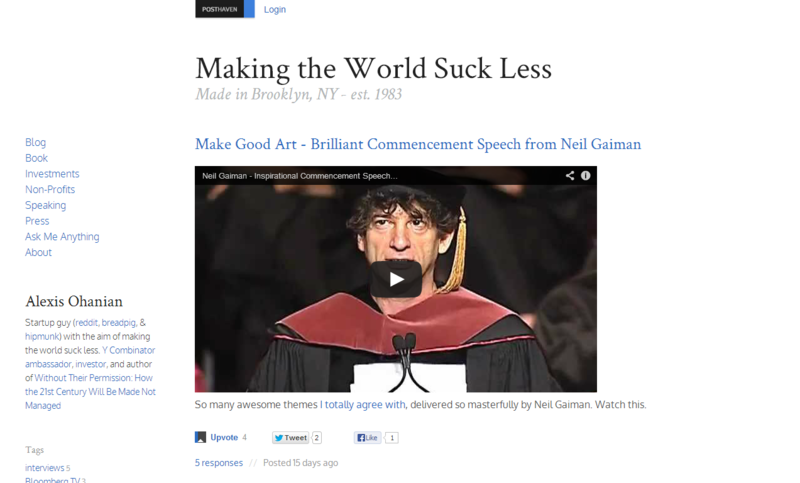 Verdict: Medium is well worth trying, but many of the folks that write there use it as a secondary or tertiary blog. The user interface feels like a doodle pad or to-do list, making it a place where I can easily jot down thoughts and come up/develop ideas, while it runs in Markdown. Just looking at the layout that readers see shows the elegance and thought behind the site. 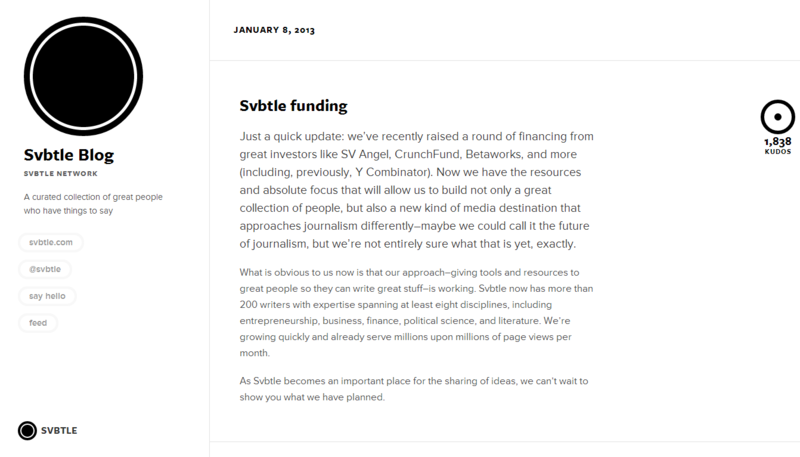 Svbtle was initially available on an invite-only basis when this blogging guide was first published, but the service later opened up to all users in January 2014. Cons: Interestingly, it doesn’t include a commenting system — perhaps a pro and con. Verdict: Svbtle offers something different to what is already out there. You might be surprised to see popular question and answer site Quora feature here, but it added user blogs back in January 2012. As a platform for showcasing knowledge, bloggers that are seeking to tell stories or impart wisdom about particular topics may find Quora useful. Posts can be categorized using Quora tags — to make them searchable — and, with a little luck and the right content, they can become visible and widely shared. However, there’s no personalization and Quora is very much a place to showcase writing and knowledge rather than be your ‘home’ on the Web. Pros: Strong community that soaks up new and interesting content. 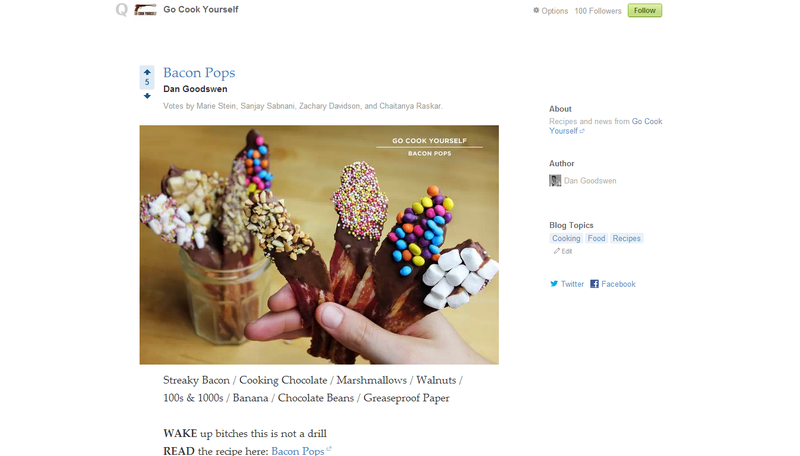 Cons: Lacks personalization and ‘homely’ feel of a personal blog. Verdict: Quora blogs are interesting for influencers, those seeking to elevate their status or others wanting to tap into the Quora community. That makes it better suited as a secondary of tertiary blog. Popular note-taking app Evernote lets you share content written within its platform, but it’s not really a blog. That’s where Postach.io comes into play. The blogging service slots into Evernote, allowing you to write posts right from the service using a dedicated notebook and set keywords like ‘published’, ‘page’ or ‘avatar’. More than just writing content from Evernote, Postach.io hooks into comment engine Disqus, supports Google Analytics, allows for custom domains, social sharing and — interestingly — Markdown. The service is currently in beta but those features, plus a decent selection of customizable themes, gives Postach.io a Posterous-like, easy-blogging feel. Pros: Light-weight and easy to use. Verdict: A relatively new arrival on the blogging scene, courtesy of Evernote’s community of third-party apps and services, this is worth considering for jotting down quick thoughts or multimedia-rich posts. 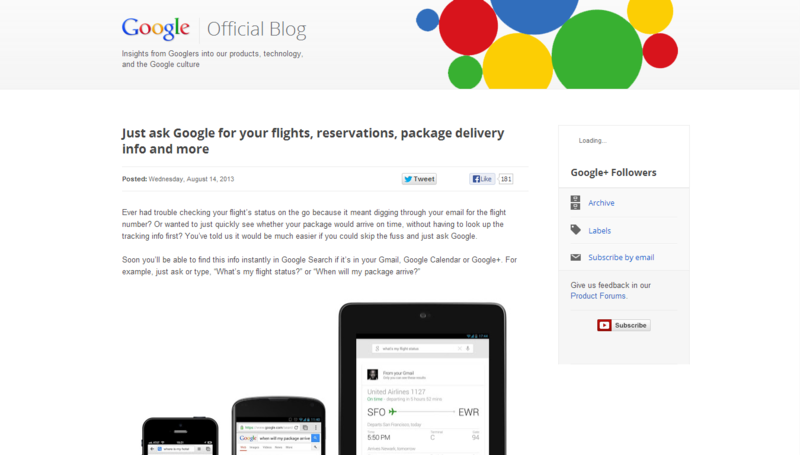 Is Google+ a social network? Well, Google says it isn’t — the company believes it’s somewhat broader than that — and a range of the service’s top users write blog like content there, often generating seeing impressive engagement. 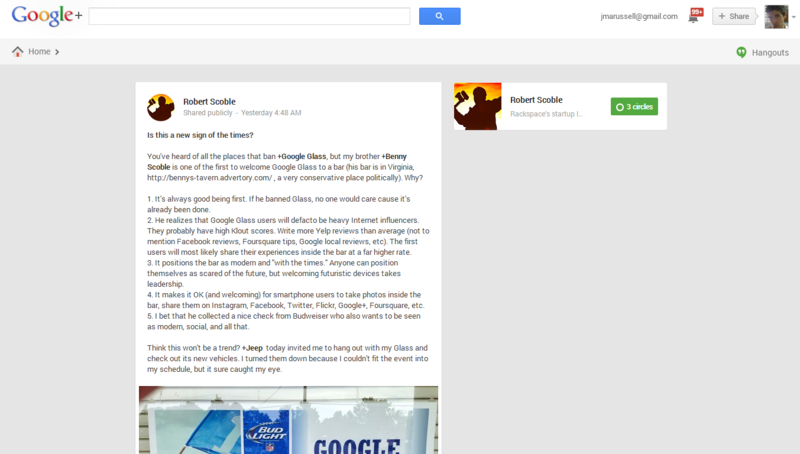 TNW contributor Robert Scoble has, for example, cut back on his blog in favor of “betting my future” on Google+. Ultimately Google+ is not a blog, but it is a place where you can blog if you want to tap into a community to drive engagement. These days most content is shared to social media, so why not start it on social media? That’s up to you. 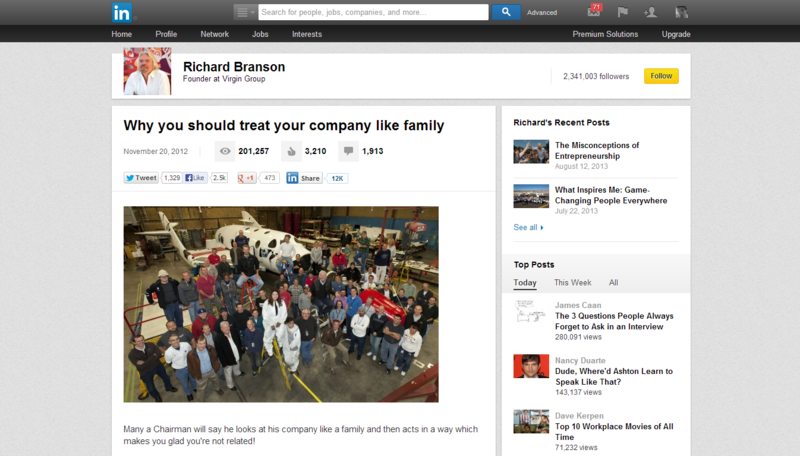 Pros: Google+ has a strong community, despite the reports. Cons: Not a blog platform so no customization or other features. Verdict: Good enough for some people, so not to be dismissed as an option. 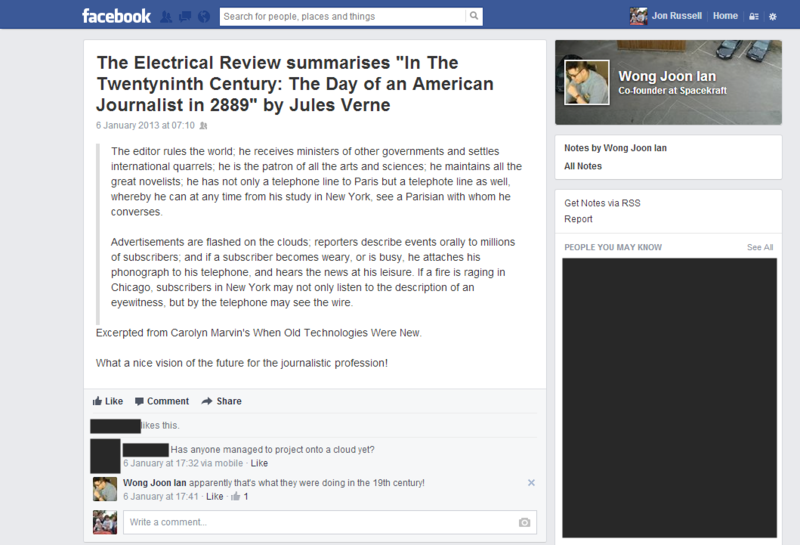 At the risk of treating all social networks as blogs, something we’ve no intention of doing here, Facebook has been added because its Notes feature is, essentially, a blog platform. Connected to the world’s largest social network, Facebook Notes allows you to pen posts with all the basic features, such as images, URLs, block quotes, etc. While it won’t win awards for design and sophistication, it’s a simple way to get the message out — especially if you’re a person with an established following on Facebook. Pros: 1.1 billion people user Facebook each month. Cons: There’s a lot more to the Web than just Facebook. Verdict: We’ve got enough of Facebook already, particularly when there are a plethora of services dedicated to providing a dedicated blogging experience, rather than adding it as a mere feature. 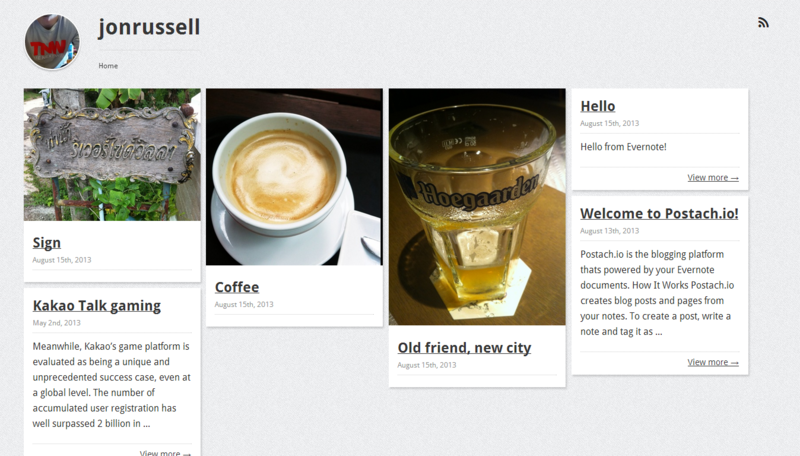 SETT is a new, community-focused blogging platform that promises engagement. Similar in style to Medium and Svbtle, it claims it can help writers get 98 percent more comments — on average — and a lot more attention, just based on its community of users. The platform allows readers to follow blogs, find similar posts and bloggers, communicate with each other — there’s even a ‘room’ where readers can discuss topics from a blog. The site is clearly focused on engagement, promising to help cultivate an audience and community for its bloggers. Pros: Boasts impressive engagement and opportunities to find audiences. Cons: Still in its early days, and without the features of other platforms. Verdict: This promising platform may be worth investigating as a means to help establish an audience, but we can’t help but feel that there’s only so many guarantees you can make for engagement. Ultimately, good content drives readers and audiences. 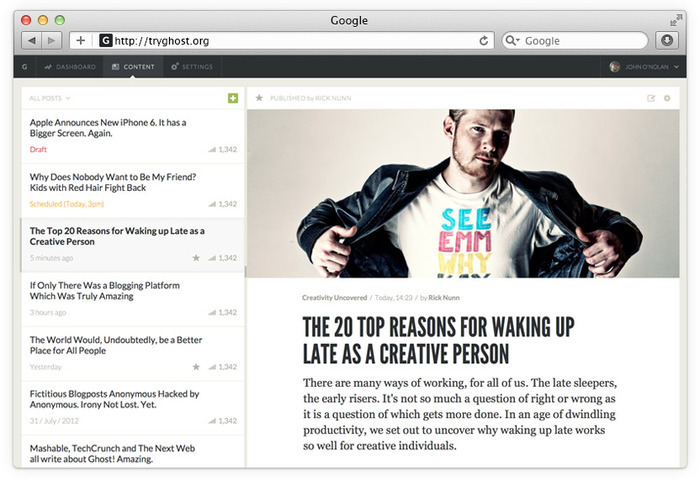 Ghost is an open-sourced blogging platform that successfully graduated from Kickstarter in May 2013 having raised near $300,000 — well above its modest $25,000 goal. Initially limited to those who backed it on Kickstarter, Ghost is open to all users who can choose to quickly set up a basic blog or download the Ghost software and install it on their own web server. The tiered pricing plan starts at $5 per month for a single blog getting 10,000 monthly pageviews, and goes up to $80 per month for up to 30 blogs with 500,000 pageviews. The platform has garnered much praise across the Web for its elegance and its team promises to “inspire” bloggers with a fully customizable system and “revolutionary” dashboard. Pros: Brings a fresh style and new approach, with a series of packages that could appeal to enterprise and business customers. Cons: Isn’t free. Less tech-savvy users may find the system more complicated than others. Verdict: Ghost got a lot of people excited with it promise to bring new impetus to blogging, but paying to host the blog — on top of domain fees — may be excessive for some. 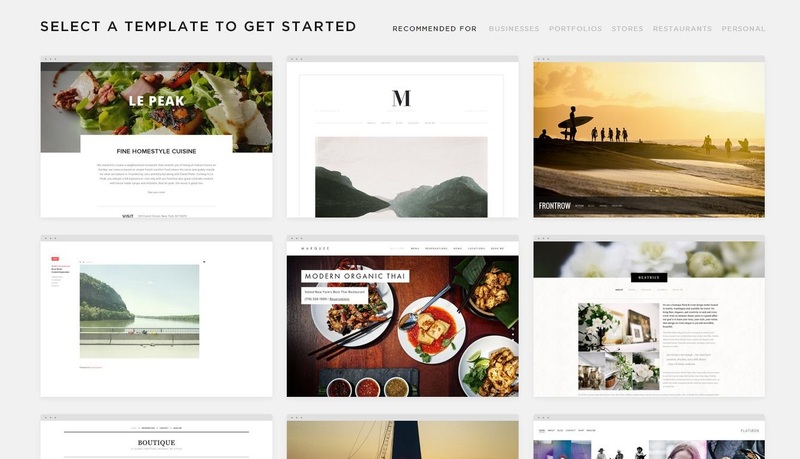 Squarespace is a blogging platform that is popular with business users. Developing and hosting blogs is just one part, and it can be used to create and manage a range of websites, such as e-commerce sites. Unlike most of the others, there is no free option, bar a 14-day trial, with sites priced upwards of $8 per month via an annual plan. That plan encompasses all elements of your blog or website, however, including cloud-based hosting and maintenance. Pros: Wholly comprehensive set of features and services, gorgeously designed. Verdict: A must-consider if you’re a business, but other options will be better if you’re setting up a blog or site on a smaller scale. Another blogging old-timer, TypePad has been about since the word ‘blog’ began. Today, a blog on Typepad costs upwards upwards of $8.95 per month, which includes a set of designs, unlimited storage and customer service. Typepad emphasizes its reliability, and certainly the platform has always been a more ‘out-of-the-box’ service that is easier to use, but less customizable and powerful than WordPress. Cons: Not free and contains limitations. Verdict: Typepad still has its users, including cult blogger Seth Godin, but other options have greater freedom, including your own custom domain name. Posthaven arose from the shutdown of Posterous, which finally disappeared off the Web this year under the ownership of Twitter. The service costs $5 per month and essentially replicates the Posterous ‘light-blogging’ experience, allowing posts and multimedia to be easily and quickly published. The Posthaven team promises it will never be acquired or go offline, two things that hit users of Posterous hard. Pros: Not in danger of going offline. Cons: Still in its infancy and adding some features other services already offer. Verdict: A good option for those who loved Posterous and are prepared to invest in their blogging, in the knowledge that paying for a service provides security for the future. The Web’s top business social networking service launched blogs for ‘Influencers’ back in October 2012, signing up 150 prominent business leaders, including the likes of Richard Branson and President Obama. LinkedIn blogs were initially for ‘influencers’ on an invite-only basis, however that requirement was dropped in February 2014, which means that anyone can blog on LinkedIn. I personally believe that LinkedIn’s foray into publishing platforms is interesting because it makes its money from its main service, which could mean it is less constrained with the features and services that it can offer. Pro: Now open to all. If you have a strong LinkedIn network this is one way to engage it. Cons: Like Medium and other template platforms, there’s no customization. Verdict: An interesting option that I suspect will suit best for those who have a large network on LinkedIn, or are looking for a secondary/more public blogging option. Finally, let’s pour one out for the fallen heroes of the blogging revolution. Posterous: Posterous’ days always seemed numbered when it was acquired by Twitter in March 2012 in a deal that appeared to have been done to get hold of the developer talent behind the site. That fateful day confirming its closure came in February, and Posterous left the Internet on April 30 2013. Xanga: One-time blogging pioneer Xanga remains on life-support after a campaign to raise $60,000 just passed the target. The company is collecting contributions until the end of August, after which it will relaunch. Perhaps our obituary is a little premature? LiveJournal: Not dead just yet, but this former blockbuster is now a community-based social network owned by a Russian media company. Over to you: Did we miss one from our list? Which blogging platform is your favorite and why? We’ll take some time to check out ther services mentioned in the comments and will add the best ones to the list.